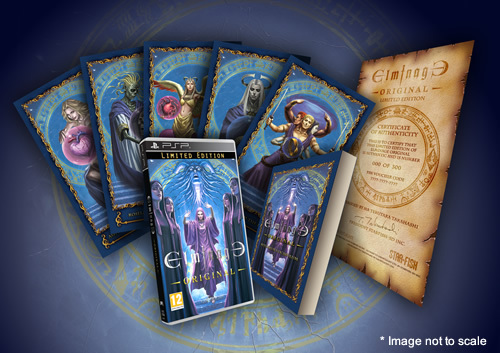 Ghostlight has updated their blog with news on the upcoming European release of Elminage Original. Pre-orders for the PSP dungeon-crawler title will officially open up via the Ghostlight website August 22. The game’s exact release date and price point weren’t mentioned in the latest update, but they will be revealed when pre-orders begin. If you act fast, you can pick up one of only 300 Limited Edition bundles. See the photo below for a sample of what’s included. Elminage Original was released in North America last year and is available for download on PSP and PSVita systems via PlayStation Network. Developed by Starfish-SD, the game features an epic fantasy setting full of magic, monsters, turn-based combat, quests, and dungeons. What more could a classic hero want? Ghostlight has also given a quick update on how pre-orders are coming along for Shin Megami Tensei: Devil Survivor 2. They report that 627 orders have been placed so far. Ghostlight is aiming to have 1,800 units ordered by the time pre-ordering closes on August 30th. If they don’t reach that goal, then the game will not be released, and everyone who placed an order will receive a full refund. Fans have the option of ordering the Shin Megami Tensei: Devil Survivor 2 Standalone Release or the Devil Survivor Bundle, which also includes Shin Megami Tensei: Devil Survivor Overclocked.